There are several ways of spelling Finbarre but the most common spelling is as shown. His connection seems rooted in several religious sites across the Lee Valley from source (Gougane Barra) to mouth (Cork City). Finbarre’s Life was composed initially in Latin between 1196 and 1201 AD. His life was transmitted along three principal lines, each marking a major revision of the original text. In all, Finbarre’s Life survives in 35 manuscripts and twenty-one copies of the early vernacular life. Finbarre’s written vernacular life has undergone little major change between its earliest and latest extant copies. These date respectively to about 1450 to 1874. Finbarre’s original life seems to have been composed, perhaps as part of a collection, in Cork between 1196 and 1201 AD, some 25 years after the arrival of the Normans in South Munster. This was a time of reform in the Catholic Church. FinBarre’s hermitage was located around the area of present-day Gillabbey Street. It grew to be an important religious centre in southern Munster, providing ecclesiastical services in the form of a church and graveyard, and secular services in the form of a school, hospital and hostel. The annal evidence for the school relates that languages such as Latin were taught and that it was one of the five primary sites in Ireland in terms of size and influence. Word quickly spread of the monastery’s valuable contribution to society, and it became necessary to expand the site. Between AD600 and AD800, a larger hermitage was constructed east of the original site on open ground now marked by St. FinBarre’s Cathedral. It is believed that over the subsequent centuries this hermitage grew to a point where it extended along the northern district of the Lough, and extended on both sides of Gillabbey Street and College Road about as far as the locality now occupied by University College Cork (UCC). 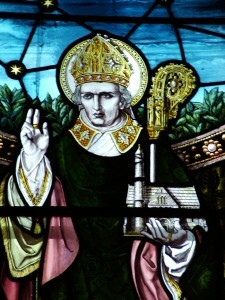 Around the year AD623 St. Finbarre died at the monastery of his friend, St Colman, at Cloyne in East Cork. His body was returned to his hermitage and his remains were encased in a silver shrine. Here they remained until 1089 when they were stolen by Dermod O’Brien. The shrine and the remains have never been recovered. Legend has it that the location of his tomb is just to the southeast of the present cathedral, overlooked by the famous Golden Angel. St Finbarre’s feast day is celebrated on 25 September. As the city’s patron saint he is still greatly revered.